"Collier and Harper in Big Book Merger"
Peter Fenelon Collier (b. 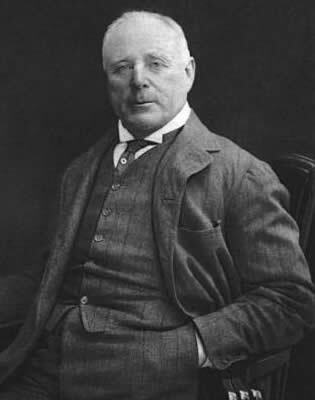 1849 - d. 1909) founder of P. F. Collier and Son. By the time the company that bore his name acquired the rights to publish Mark Twain's uniform editions, both he and his son Robert were dead. Peter Fenelon Collier was an Irish immigrant born in 1849 who came to the United States in the late 1860s. A devout Catholic, Collier attended St. Mary's Seminary in Cincinnati, Ohio for a brief time and afterward began working for publishing companies in the area. 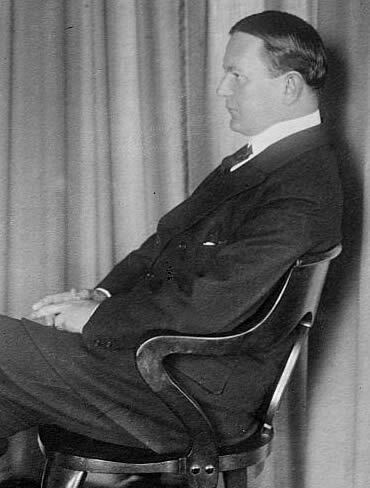 Collier believed the business of book publishing could be successful if customers were offered the opportunity to buy books on an installment plan. A man with keen business sense, he relocated to New York in 1874 to start his own firm that would focus on selling books by allowing customers to pay small monthly payments for their purchases. Most of the books he handled were Bibles, other books aimed at Catholic buyers, and inexpensive reprints of works by writers such as Charles Dickens, James Fenimore Cooper, Sir Walter Scott and other classics. By 1880 Collier had become successful enough to open his own print shop and had established a highly efficient subscription sales operation. In 1888 he established a weekly magazine called Once a Week. In 1896 the magazine was reorganized as Collier's Weekly. In 1898 Collier's only son Robert joined his father in the business and the firm was renamed P. F. Collier and Son. Robert Joseph Collier was born in New York in 1876. He was educated in New York public schools and later at Georgetown University in Washington where he graduated in 1894. He then spent two years at Oxford and at Harvard. 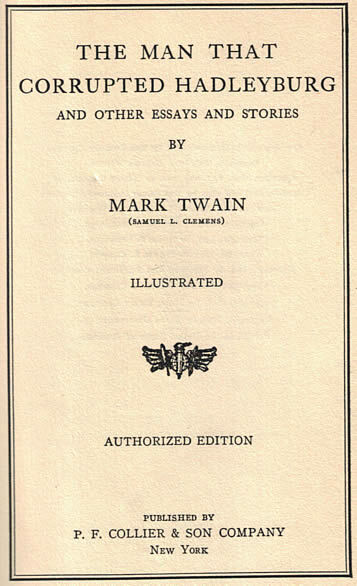 Robert Collier courted Samuel Clemens with offers to publish an inexpensive uniform edition of his works that would be sold on the installment plan. Collier's continued competition to gain access to Mark Twain's body of work forced Harper and Brothers to offer Clemens a contract in 1903 which matched Collier's offer. (See Chapter 6 for details of Collier's offers.) 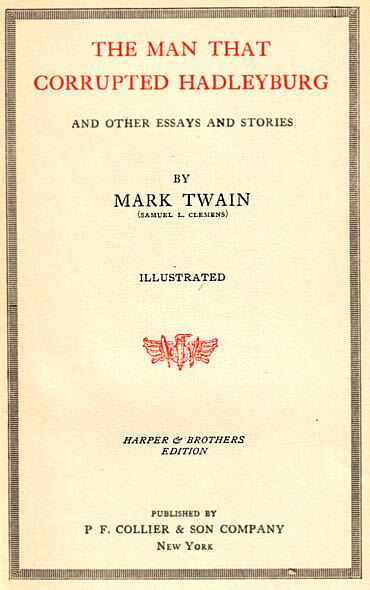 In 1909 Harper and Brothers issued Mark Twain's Author's National Edition on the installment plan after refusing yet another offer from Collier to distribute the works in that manner. Dear Robert: If in my time I shall have your good and dear father's happy fortune, be glad for me, as I am glad for him; but grieve for those I leave behind, as I am grieving for you and yours. Nine years later, Robert Collier's death on November 18, 1918 marked the end of the Collier association with the publishing house that bore his name. However, new owners would retain the company's name until the 1970s. The terms of Robert J. Collier's will left his publishing business in the hands of his business associates William Payne Whitney (b. 1876 - d. 1927), Francis P. Garvan (b. 1875 - d. 1937), and Finley Peter Dunne (b. 1867 - d. 1936). In January 1919 Thomas L. Briggs (b. 1880) was selected to head the company. A few months later in July 1919 the P. F. Collier and Son Company was sold to Crowell Publishing Company, a company that also owned the magazines Woman's Home Companion, American Magazine, and Farm and Fireside. The Crowell Company was originally based in Springfield, Ohio. The company's origin can be traced back to wealthy Springfield industrialist Phineas P. Mast who had made his fortune manufacturing farm implements. Mast began publishing a small farm journal titled Farm and Fireside in 1877 and hired John S. Crowell (b. 1850) to administered the publication. By 1902 Crowell had acquired sole interest in the publishing firm. In 1906 he sold the firm to Joseph Palmer Knapp (b. 1864 - d. 1951) and George Hannum Hazen (b. 1858 - d. 1934) of New York for about $750,000 and Hazen assumed the presidency of Crowell. Both Knapp and Hazen were successful businessmen in the publishing field. Knapp was the son of Joseph Fairchild Knapp, owner of Knapp and Company lithographic firm as well as founder of Metropolitan Life Insurance company. Joseph Palmer Knapp had attended Brooklyn Polytechnic Institute and Columbia University. In 1895, he founded American Lithographic Company and was instrumental in developing a multicolor press which helped him establish Associated Sunday Magazine in 1903, the first magazine supplement for daily newspapers. Hazen attended New York University and joined the Century Company publishing firm after graduating. Both Knapp and Hazen were situated to make the P. F. Collier and Son Company a cornerstone of their publishing empire as they ventured into the book publishing business. The company was reorganized and the parent firm became Crowell-Collier with the imprint of the P. F. Collier and Son Corporation as a subsidiary. Retaining the Collier name was an effective tribute to the reputation of Peter Fenelon Collier and his son Robert. In 1921, in spite of the success of selling Mark Twain's Author's National Edition on the installment plan, the Harper and Brothers publishing company was still indebted to financier J. P. Morgan for over a million dollars. Harper vice presidents Thomas Bucklin Wells and Harry Hoyns came up with a plan to liquidate the debt. Part of the plan consisted of selling off the subscription book branch of their business including the manufacturing equipment. Morgan approved the plan and in August 1921, Harper and Brothers announced the company had sold their entire subscription book business to the P. F. Collier and Son company. 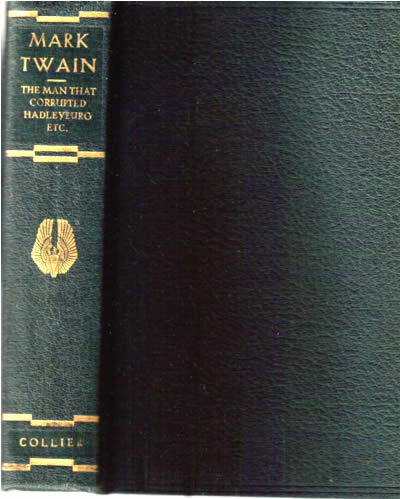 Subscription editions transferred to Collier included Mark Twain's Author's National Edition. According to an article in The New York Times dated 4 August 1921, Harper had published six million volumes of Mark Twain's subscription works. At 25 volumes per set, that would total approximately 240,000 sets of the Author's National Editions. Harper's press release which was quoted in the same New York Times article stated the company had paid $84,000 to Mark Twain's estate the previous year. With money from the agreement, Harper and Brothers were able to pay off over $100,000 of the Morgan debt from the transfer of the subscription rights and $90,000 from the sale of the manufacturing equipment. P. F. Collier and Son Company advertised for salesmen shortly after acquiring the Harper subscription business. Other ads indicate they sold Harper's existing inventory of the green cloth Author's National Edition on the installment plan for $49 in twelve monthly payments. Ad from American Magazine, October 1921. Collier's subscription sales strategy for the 25-volume set of the Mark Twain's Author's National Edition utilized many of the same types of newspaper and magazine advertising that had been implemented by Helen Woodward for Harper and Brothers. (For more information on Helen Woodward's ads, see Chapter 8.) These ads featured scenes from Mark Twain's stories designed to spark a reader's interest. However, there were a few key differences in Collier's sales strategies. The earliest Collier ads did not specify pricing and were designed to attract buyers by offers of a free pamphlet containing a sample of Mark Twain's work "How to Tell a Story." 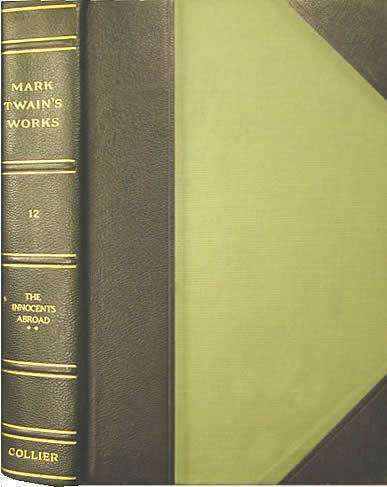 Customers who replied to the ads received information on how to purchase a uniform edition of Mark Twain's works. 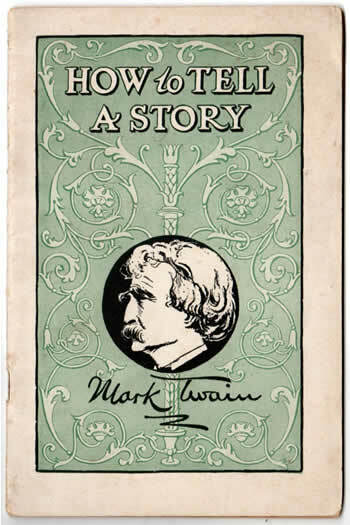 Beginning in 1922 Collier used this booklet as an advertising enticement featuring Mark Twain's "How to Tell a Story." It also contained eulogies from former U. S. Presidents Theodore Roosevelt, William Howard Taft, and Woodrow Wilson. 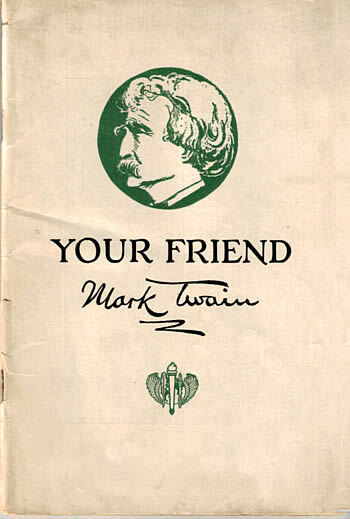 In 1925-1928, Collier ads featured a free pamphlet with this cover for readers who responded by mailing in requests for more information on Mark Twain's Author's National Edition. On March 20, 1922, the same month that P. F. Collier and Son was advertising Mark Twain's Author's National Edition in Atlantic Monthly, the New York Tribune reported that rare book dealer Gabriel Wells had purchased the rights from Collier and Son to a forthcoming limited number 35-volume set of Mark Twain's works for $200,000. 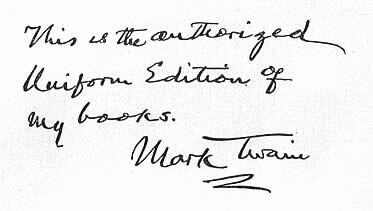 The edition, to consist of 1,024 sets, would be called the "Definitive Edition" and would include an autographed flyleaf from Mark Twain's hand from stock recently discovered in the Harper and Brothers vaults. Why Collier and Son released their rights to a forthcoming autographed edition is unclear but a quick profit likely figured into the equation. Collier's marketing remained focused on book buyers who could not afford elaborate autographed editions. What would be known as the Gabriel Wells Definitive Edition released in 1922 would be geared to a different class of bookbuyers and would offer little competition to buyers of the P. F. Collier and Son editions. The P. F. Collier and Son Author's National Edition was advertised in two bindings -- cloth and half-leather. At first glance, the Collier green cloth binding is almost indistinguishable from the green cloth Harper and Brothers Author's National edition. However, the word "Collier" appears at the bottom of the spine of these editions. A much more radical change is the renumbering of the volumes. The renumbering of the volumes can be a source of confusion for collectors who attempt to purchase single volumes for incomplete sets. Green cloth Collier editions contain the same content as the Harper and Brothers green cloth editions issued after 1917 but the Volume numbers are different. The following table compares volume numbers between the Harper and Brothers Author's National Editions after 1917 and the P. F. Collier and Son Author's National Editions of Mark Twain's works. Vol. 20 - Tom Sawyer Abroad / Tom Sawyer Detective and Other Stories, Etc., Etc. Vol. 2 - Tom Sawyer Abroad / Tom Sawyer Detective and Other Stories, Etc., Etc. This flyleaf appears in all volumes of the Author's National Edition. This authorization statement appears on the back of the flyleaf. The Collier title pages of the Author's National Edition state "Harper & Brothers Edition"
No advertisements for P. F. Collier and Son's Author's National Edition have been found after 1928. In 1903 Frank Bliss had predicted that if Collier produced a low priced set of Mark Twain's works "at the end of 2 years Collier's would be worked out & the market virtually gone in all probability" (See Chapter 6 for the comments from Bliss's notebook). Harper and Brothers had worked the subscription market themselves for over ten years prior to turning the subscription sales over to P. F. Collier and Son. With decreased advertising and no evidence of surviving sales ledgers, the best record of Collier's marketing techniques are the books themselves. The "Author's National Edition" was eventually replaced with Collier's "Authorized Edition" which is most often found in sets of 10 titles which were the titles of the first ten titles from Collier's Author's National Edition (see above chart). Works that had been divided into two volumes such as The Innocents Abroad, A Tramp Abroad, Following the Equator, Roughing It, The Gilded Age, and Joan of Arc were dropped from the 10-volume sets. Volume 12 of a 25 volume Collier edition in partial leather binding. For a 10-volume set, cloth binding stamped to resemble leather has only a floral embellishment in place of volume number. Only the first ten titles from the Collier's Author's National Edition have been found in this binding. The title page states "Harper and Brothers Edition." Evidence suggests that the idea of 10-volume sets may have originated with Harper and Brothers prior to the sale of their subscription business to P. F. Collier and Son. No 25-volume sets by either Harper and Brothers or P. F. Collier and Son have been found in this blue cloth binding with the MT monogram on the spine. The Collier volume is identified as "Harper and Brothers Edition" on the title page. Titles identified as P. F. Collier and Son "Authorized Edition" are most frequently found in a green cloth binding stamped to resemble leather. All 25 titles that were formerly issued in the Author's National Edition have been found in this binding without individual volume numbers. It is likely that buyers had a choice of purchasing either 10-volume or 25-volume sets in this green cloth binding. Collier green cloth binding of Authorized Edition was likely issued about 1928. 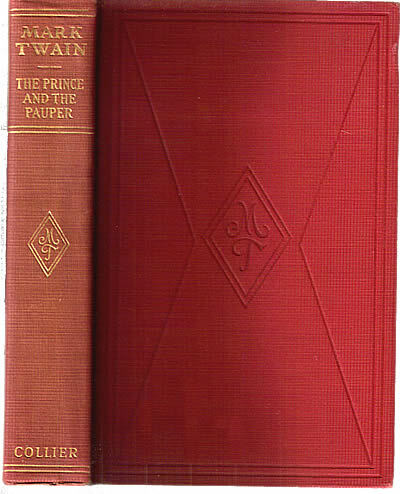 Collier also published the Authorized Edition of Mark Twain's Works in both red cloth and red leather bindings featuring an MT monogram inside a diamond on the spine and cover. Ten titles in this binding have been found with 1930s bookplates. No 25-volume sets have been found in this binding. Collier Authorized Edition in red cloth binding. 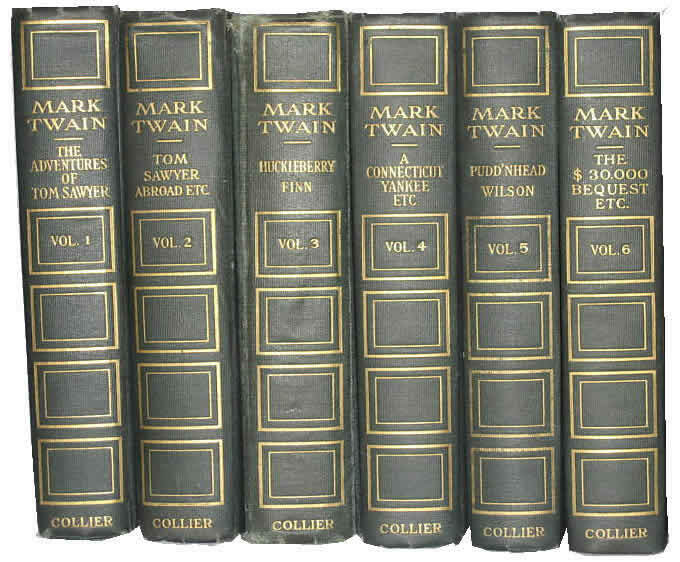 Mark Twain's works were marketed under the P. F. Collier and Son label for well over a decade. Their customers were those who bought books on the installment plan. This sales method continued to provide Mark Twain's works to working class Americans willing to pay a few dollars a months for a uniform edition of books. Harper and Brothers, however, were not content to abandon sales to customers willing to pay premium prices. 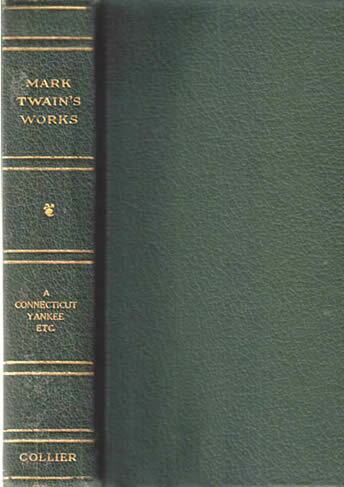 The next round of uniform editions of Mark Twain's works would be issued in sets of over 30 volumes and would again contain autographed pages. The old 25-volume Author's National Edition would be a thing of the past. "Buys Collier's Weekly," The New York Times, 26 July 1919. Collier, Robert J. In Memoriam, Peter Fenelon Collier. (Privately printed, 1910). Online via google books. "Collier and Harper in Big Book Merger," The New York Times, 4 August 1921, p. 4. Dzwonkoski, Peter. Dictionary of Literary Biography: Volume Forty-nine. American Literary Publishing Houses, 1638-1899, Part 1: A-M. (Gale Research Company, 1986). Exman, Eugene. The House of Harper: One Hundred and Fifty Years of Publishing. (Harper and Row, 1967). "George D. Buckley, Banker, Dies at 55," The New York Times, 20 December 1935, p. 25. "George H. Hazen, 76, Publisher, Is Dead," The New York Times, 3 May 1934. Hapgood, Norman. The Changing Years: Reminiscences of Norman Hapgood. (Farrar and Rinehart, 1930). "Joseph P. Knapp, 86, Publisher Is Dead," The New York Times, 31 July 1951, p. 25. Ketupa.net: A Media Industry Resource, "Crowell, Collier, Knapp" (website accessed 1 December 2010). "New Head of Collier's," The New York Times, 2 January 1919, p. 8. "New Mark Twain Edition de Luxe Brings Top Figure," New York Tribune, 20 March 1922, p. 11. "Peter F. Collier Dies of Apoplexy," The New York Times, 24 April 1909, p. 1. R. J. Collier Dies at Dinner Table," The New York Times, 9 November 1918, p. 13. "Refuse to Accept Collier's Estate," The New York Times, 17 December 1918, p. 1. Subscription to America: Crowell-Collier's Influence on the American Identity (website accessed 1 December 2010).